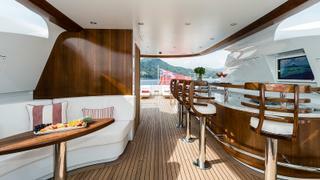 The star attraction on board the 43 metre Gulf Craft 140 C'est La Vie is undoubtedly the cigar lounge in the upper saloon. Set in a decor of all Italian marble with onyx costa blanca for the floor, the bar features tobacco leaves set in backlit panels installed at the owner's request. The star attraction on board the 43 metre Gulf Craft 140C'est La Vie is undoubtedly the cigar lounge in the upper saloon. Set in a decor of all Italian marble with onyx costa blanca for the floor, the bar features tobacco leaves set in backlit panels installed at the owner's request. 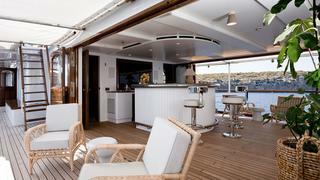 The 28.5 metre Viking 93 actually features two bars on board. 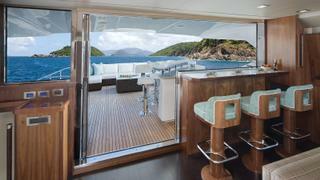 The bar on the bridge deck sits with three stools facing outward but feels completely al fresco when the powered window recedes into the bar and the adjacent bi-folding door opens. This arrangement means the bar is completely sheltered from the elements while allowing those sitting at the "inside" bar a direct line of communication with those sitting at the outside bar. 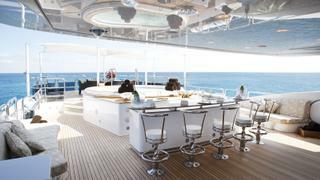 The upper deck of the 40 metre Conrad flagship Viatoris provides the perfect space for al frescso sundowners and came about after her owner expressed a desire to create zones on this deck. 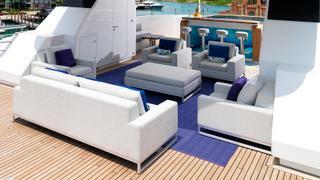 As a result, it has the feel of a much larger yacht and offers a dining area, a seating area to starboard and a boomerang-shaped bar to port. The superyacht sundeck on 49.8 metre Home is party central, with low-slung Paola Lenti furniture, spa pool, projector screen and even a dancing pole, but it is the vast bar that is sure to be centre of attention. Measuring 4.8 metres long and built from translucent Corian, this spectacular drinks station features multicolour LED backlighting — ideal for creating a vibrant atmosphere. 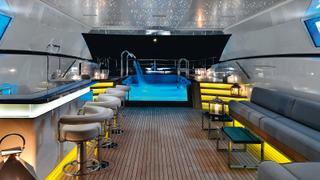 Our round-up of the best superyacht bars in the world continues with the 44.85 metre Sunrise superyacht Atomic. 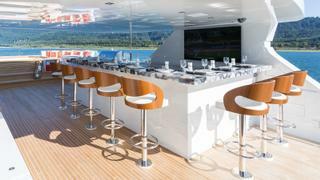 Her big television and warm wood surroundings make the sundeck bar the perfect nook for watching sports. For live action, there’s also a trap ready to fire clay pigeons out over the ocean. With its backlit crystal agate and mirrored glass counter, the massive sundeck bar of this 49 metre Christensen yacht offers plenty of space for a genuine get-together. Launched in 2016 for telecoms entrepreneur Donald Burns, Chasseur’s contemporary styling earned her a place on the finalists' shortlist for the 2017 ShowBoats Design Awards. The marble-topped wet bar on this 60.95 metre Benetti superyacht mirrors the glamorous James Bond-inspired interior décor. Built for auto magnate John Staluppi, Diamonds Are Forever hit the water for the first time in 2011, sporting lavish interior styling from designer Evan K Marshall. 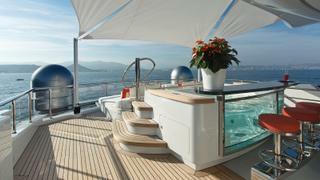 Her spacious accommodation allows for up to 12 guests and 15 crewmembers. The sundeck on this 60 metre Abeking & Rasmussen superyacht combines a social bar and spa pool forward with a cosy nook, situated aft, which is ideal for more private drinks. Styled inside and out by UK-based studio Reymond Langton Design, Excellence V emerged from the German yard back in 2012. The top deck of this 70 metre Rossinavi superyacht is party central, with light-up bar, pool and a helideck that converts to a dance floor with disco lighting. 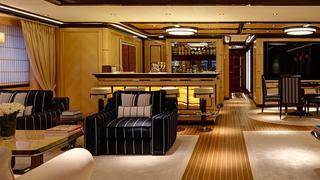 But this isn't the only bar on board High Power III — move downstairs to discover a jewel box-like speakeasy, studded with lights inspired by sea urchins. The sundeck bar on the 61 metre Hakvoort superyacht Just J’s is a thing of beauty — set up against the glass side of a spa pool with a sea-themed mosaic spilling out underneath the stools, this is an idyllic spot for enjoying a sundowner. This is another notable superyacht with more than one bar area, as the private owner's deck also includes a well-stocked cocktail lounge. 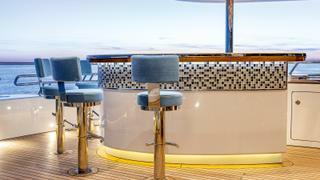 The huge LED screen makes the bar a show-stopping spot for pre-dinner drinks on 51 metre MySky. The main saloon is a study in circles, featuring a round dining table, a circular sofa and two round coffee tables. Erick van Egeraat was responsible for the interior design of this Heesen, which marks his first foray into yacht interiors. The design is based around a monochrome colour-palette that includes white leather, dark high-gloss Makassar wood and backlit white onyx inlaid with black marble. 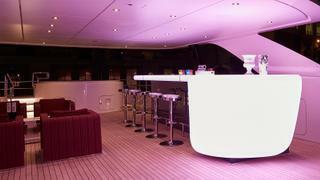 The huge LED screen makes the bar a show-stopping spot for pre-dinner drinks on 51 metre MySky. The main saloon is a study in circles, featuring a round dining table, a circular sofa and two round coffee tables. Erick van Egeraat was responsible for the interior design of this Heesen, which marks his first foray into yacht interiors. The design is based around a monochrome colour-palette that includes white leather, dark high-gloss Makassar wood and backlit white onyx inlaid with black marble. Backlit honey agate at Rock.It’s bar warms the ambience of this 60 metre Feadship’s whole bridge deck saloon. Rock.It's hands-on owner was described by Feadship director Henk de Vries as "unconventional and no-compromise". He worked very closely with Sinot Exclusive Yacht Design to ensure Rock.It met his brief for it to a striking, innovative and sporty yacht. The upper deck day bar on this 64 metre classic yacht is the ultimate indoor-outdoor space, with open vistas and sheltered seating. The view from the upper deck hasn’t changed much from how it would have looked when Shemara was built in 1938 and she has now been returned to her former glory. After years of negotiation Shemara was bought by Sir Charles Dunstone in 2010 and sent to be rebuilt. Three years and one million man-hours later she was successfully relaunched — sparking, pristine and complete. The upper deck day bar on this 64 metre classic yacht is the ultimate indoor-outdoor space, with open vistas and sheltered seating. The view from the upper deck hasn’t changed much from how it would have looked when Shemara was built in 1938 and she has now been returned to her former glory. After years of negotiation Shemara was bought by Sir Charles Dunstone in 2010 and sent to be rebuilt. Three years and one million man-hours later she was successfully relaunched — sparking, pristine and complete. 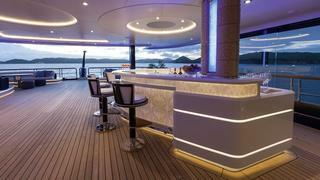 A chic lighting design on the sundeck bar of 85 metre Solandge creates a glamorous evening hang-out. This Lürssen superyacht was designed by Espen Øino and has many other notable design features, including a spectacular superyacht fireplace. The Eileen Rodriguez designed interior has a mix of rare materials including 49 different types of stone and 33 exotic woods.